Grow your patient base and create awareness for your medical spa. Spread awareness and increase online visibility. Increase the number of genuine reviews you receive. With a growing interest in aesthetic procedures, there has been an increase in demand for medical spas. An increase in growth means more competition. If you want your medical spa to be the best, you have already invested time and effort into training, careful selection of your procedures, and hiring a great staff. However, relying on traditional marketing practices is not enough to stand out from the competition. Implementing a comprehensive medical spa marketing plan is what you need to attract more patients and grow your practice. Medical spa marketing strategies that create a consistent online brand image will attract patients to your top-notch practice. Our team of medical spa marketing experts implements a customized plan that involves social media management, email marketing, and mobile-friendly websites to establish an online presence for your med spa. We tackle all aspects of digital marketing to maximize online visibility and we increase user engagement across different platforms to further grow your medical spa. Through the use of search engine optimization (SEO) and pay-per-click (PPC) advertising, we ensure that your practice will achieve higher online visibility and target the right patients. We make sure that your practice is maintaining top search rankings through the power of SEO by optimizing your site with the right keywords. We also leverage local search with PPC ads to deliver immediate conversions and focus on patients who are actively searching for a medical spa. Potential customers no longer need to visit your medical spa in-person to assess your services. A majority of your customers will be searching online to do so. Establishing a strong online reputation is essential in making a great first impression. 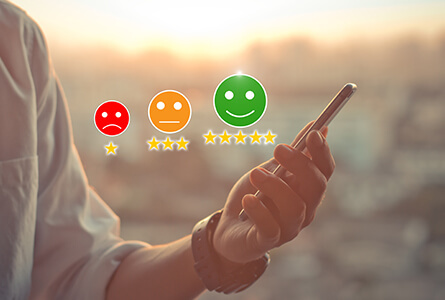 Monitoring your reviews helps you learn how happy patients are with your service. We take the initiative in improving your reviews and understanding the patient’s concern and emotions. Through our proprietary software, we survey your patients immediately after their visit and ask them to rate your service. Our reputation management software will assist you in not only improving your online reputation but also building strong, long-lasting relationships with your customers. Connect with us to improve patient acquisition rate for your medical spa practice.